The film’s excellent camerawork, sound design, and production design complement the storytelling to give the feeling of a world impossible to escape from. Gali Guleiyan demands patience, and a stomach for its unrelenting grimness and claustrophobia. It isn’t always an easy film to watch given its meditative pace, and the overarching message is important but feels a tad simplistic. Nevertheless the film’s merits far outnumber its hiccups. For Manoj Bajpayee’s performance alone, unforgettable as a man hanging on to his sanity by a thread, the film deserves to be seen. I’m going with three-and-a-half out of five. Gali Guleiyan relies heavily on atmospherics, much of which is created by Kai Miedendorp’s masterful camerawork. It snakes into the warren of lanes and decrepit rooms. There is an abiding sense of claustrophobia. Everything seems slightly rotten. I will warn you that the psychological drama does feel a bit too neatly crafted and pat especially in its conclusion. I also found the horrors of Khuddoos’ life stretched and somewhat overbearing. 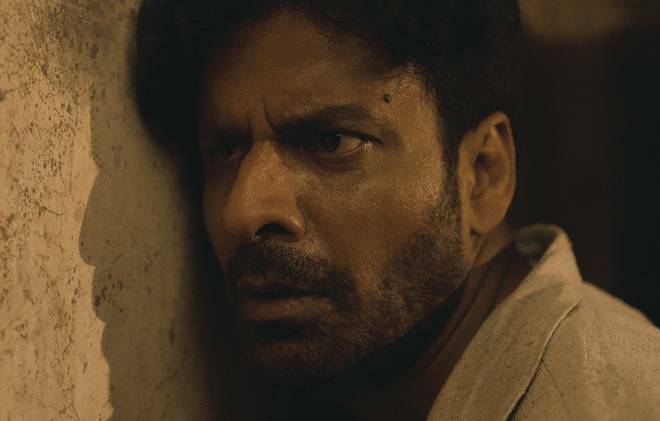 In one scene, he grimly stitches his own hand.But there is enough to admire in this ambitious first film – especially the unstinting talent of Manoj Bajpayee. Dipesh Jain has penned a story which would appeal to a very thin section of the audience, the kind which frequents film festivals. His screenplay is boring and repetitive and it moves at an excruciatingly slow pace. The drama is so depressing that it is incapable of entertaining the viewers in any way. The only surprise comes in the climax although it is not totally unexpected. Dipesh Jain’s dialogues are okay.On the whole, Gali Guleiyan will face rejection at the box-office as it holds appeal only for the festival circuit audience. When looked at through Dipesh Jain’s eyes however, life itself seems pretty bad; it seems almost to be a defence against charges of maudlinism. This means that for all its Bressonian cold brilliance, and its talent for giving us spatial dislocation, what we don’t feel in Gali Guleiyan — and this is what we should have felt — is the horror of being ineffectual. The film, however, runs aground quite early on, trying to stretch its premise of a psychological thriller too thin. The slow pace, when you may have caught on what is happening, can seem an exasperating indulgence then. A man finds himself trapped inside his own mind within a city’s walls.